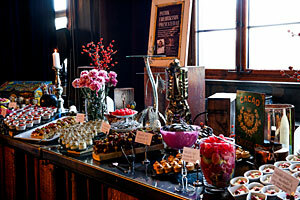 Gothenburg brunch restaurants - take a brunch on a Saturday or Sunday in Gothenburg. Book a brunch with your friends, parents, your siblings or why not bring the whole family. Very nice to enjoy all the delights that are offered. Eat a bit of the main dishes and leave a little space for the dessert. 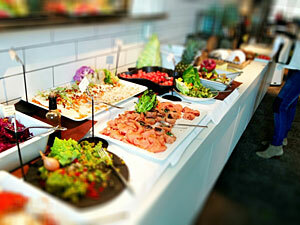 We give tip about different brunch places in Gothenburg. See the website for opening hours. During Christmas / New Year, some brunch places have closed. 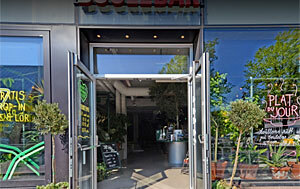 Most brunches close in the summertime / christmas and open again after the holiday and new year. 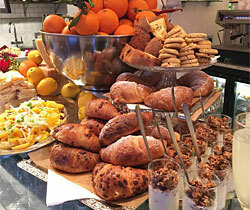 We tip about Brunch restaurants in Gothenburg! In the restaurant Atelier on the fourth floor of the Pigalle botique hotel, you can enjoy a brunch on Saturdays. If the fire does not warm up, maybe the DJ will do it. Music is played while you are eating and if you have the dance shoes on - there is no one that prevents you from taking a few dance steps. A Saturday with champagne is not wrong. The hotel has an age limit of 25 years. Atmosphere: Luxury feeling in Paris. Bloody Mary Buffe is not everyone who has - mix your own Bloody Mary and enjoy the most cold dishes. A little different is that you choose a main course from their menu. You will be received by a captain who will show you to the table. Music is played in the background and you quickly fall into a delicious brunch mood. Save some space for the nice dessert buffet. 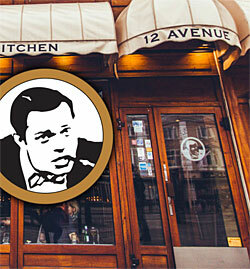 Right on the Avenyn is the cozy cafe Le Pain Francais. A 4-storey cafe and at the top they have brunch on their roof terrace. Lovely atmosphere. After the brunch you can sit by the fire. Virtually - French cheerfulness. Wonderful decor. Take a trip to the Italian place Fratelli Gridelli and try their brunch on Sundays. Do you feel for a breakfast or maybe lunch - go here you will not regret it. Very good coffee. Atmosphere - Italian home feel right in the city center. Breakfast buffet and Saturday brunch. 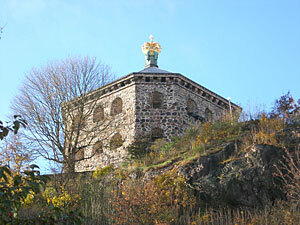 Visit Italy in Gothenburg. 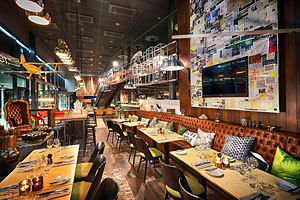 Take to Gothia Towers and enjoy Italian food with fine ingredients! Big variations in a beautiful environment. Atmosphere - Hotel feeling in the city center. 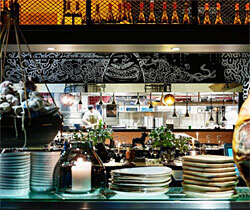 If you find yourself in town one Saturday or Sunday why not slip into Hotel Scandics Restaurant HAK right in the center. After some shoppping in Nordstan it is close to HAK. Various meat delicacies, salads, cheese and chark and homemade delicacies are served here. Atmosphere - Hotel feeling right in the city center. Another restaurant right on the Avenyn where you can enjoy an American brunch on Sundays. For those who like American pancakes, ceasar salad, mini hamburgers, scrambled eggs, bacon and much more exciting. Little Italy is also on the menu. How about pizza. Atmosphere- typical American - family-friendly. 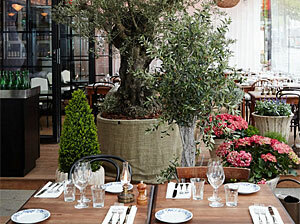 Cozy and nice Italian brunch and food. How about pasta, pizza, different cold Italian dishes, etc. Great restaurant with good access to the food. Do not miss their dessert buffet with ice cream, coffee, cakes and different pastries. Atmosphere - Cozy in nice premises. 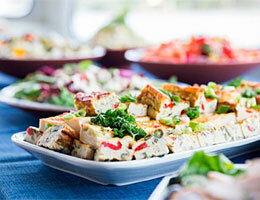 The hotel offers a brunch focusing on continental buffet on Sundays. Hot dishes are also served. Finish with their delicious dessert table. They usually also have a special Christmas brunch from Nov 29 - Dec 20. Atmosphere - Cozy hotel feel. Have a look at their "Saturday Brunch" Always a few special prices. The cafe offers brunch (or breakfast) depending on what you want to call it depending on the time you arrive. How about fresh bread with butter and toppings like cheese, brie, salami, marmalade & ham. For this a coffee, caffe latte, tea, chocolate or cappucino - and a glass of juice. Choose from omelette with bacon or yougurt. Brunch / Breakfast Monday - Friday. Wonderful cozy place. You are served the food on a plate with 3 floors. Feels very luxurious. 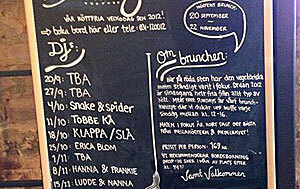 Atmosphere - cozy cheerfulness - home feeling..
Meatless brunch on Sundays on Röda Sten. Autumn brunch usually starts in mid-September - April. From April onwards, a vegetarian and vegan Sunday menu is served. For you like digs everything but meat - welcome. The Mediterranean inspires the different dishes. Atmosphere: A little industry feeling with a nice touch. 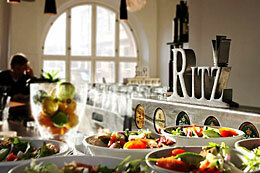 Saturdays and Sundays, Brunch is served at Hotel Ritz. Here is the table with regards to Sweden, herring, egg halves, salads, salmon, several different meat dishes, etc. Desserts table is also available. 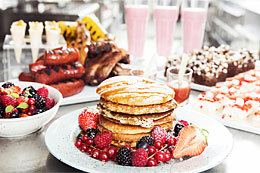 Sundays, Casino Cosmopol serves its American brunch buffet. On Saturdays and Sundays all year round you can enjoy a delicious brunch while challenging your friends in a boules match. The Boule game is included in the price. Of course, the food is inspired by France: good cheeses, salads, omelettes, ham, chicken, potatoes, croissants with marmalade and a delicious dessert table with chocolate cake, waffles, ice cream, cream and jam etc. There are 14 boulebanes indoors surrounded by mediterranean trees and other trees. A lovely French setting. 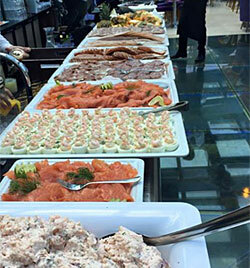 Skansken Kronan serves brunch. They serve a buffet with flavors taken from Swedish cuisine. The bucket includes spicy ribs, meatballs, sausages, lettuce salads, salmon, various kinds of pies, bread tables with cheeses and marmalades, the soup of the house, etc. After dinner you can enjoy the house's apple pie and waffles with cream and jam. Coffee and tea buffet. Free parking inside the courtyard. Visit the cozy hotel on Avenyn. Their brunch is served every Saturday. 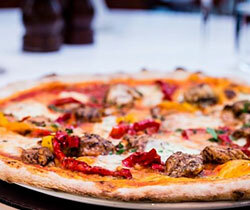 How about pizzas with good Italian side dishes. Here you eat brunch - and you eat brunch sandwiches e. They serve brunch on Saturdays and Sundays. some dishes specializing in raw food. Dessert is also available. Every Saturday and Sunday you can enjoy delights at Lindholmen. 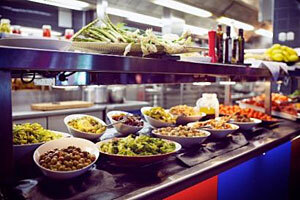 The restaurant serves grilled chicken, chorizo, scrambled eggs, bacon, plates, cold dishes, salads, herring, etc. Every Saturday and Sunday, brunch is served. The brunch adjusts after the season. Contains both hot and cold dishes and also many "green" dishes. You can eat the brunch as a breakfast or lunch - fit for both occasions. Enjoy with your family or friends. PS. Yo can also combine brunch with spa! Every Sunday from mid September you can taste a sprunch at St Jörgens Spa. Start with a delicious brunch and finish with a sparitual. Atmosphere: Calm and spa brunch. We reserve ourselves for misprints and changes.